Turkish crime scene investigators have entered the residence of the Saudi consul general in Istanbul to search for evidence in the disappearance of Saudi writer Jamal Khashoggi, as a pro-government newspaper published a gruesome recounting of his alleged slaying. 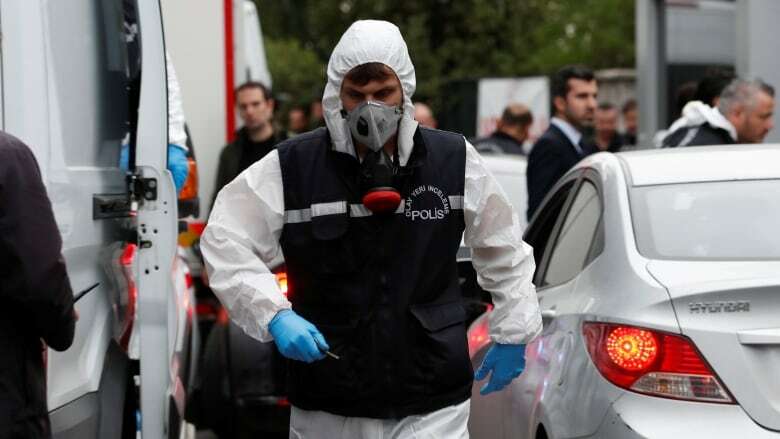 Turkish crime scene investigators entered the residence of the Saudi consul general in Istanbul on Wednesday to search for evidence in the disappearance of Saudi writer Jamal Khashoggi, as a pro-government newspaper published a gruesome recounting of his alleged slaying. Saudi Arabia's green national flag flapped overhead as forensics teams walked into the residence, only two kilometres from the consulate where Khashoggi vanished Oct. 2 while trying to pick up paperwork to get married. It was the second such extraordinary search of land considered under international law to be Saudi sovereign soil, after Turkish police searched the consulate in the early morning Tuesday. The searches and newspaper report have ensured the world's attention remains focused on what happened to Khashoggi, an outspoken Washington Post columnist who went into self-imposed exile in the U.S. over the rise of Saudi Arabia's powerful Crown Prince Mohammed bin Salman, commonly referred to as MBS. 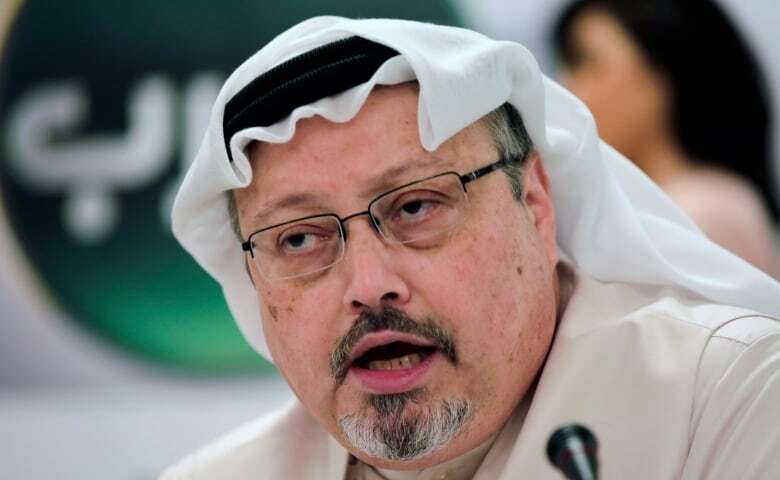 The Post published the final column Khashoggi penned for the newspaper on Wednesday — an article in which he argued for increasing freedom of expression in the Arab world. "The Post held off publishing it because we hoped Jamal would come back to us so that he and I could edit it together," said the newspaper's global opinions editor, Karen Attiah. "Now I have to accept: That is not going to happen." Khashoggi's disappearance has put further strains on the relationship between the kingdom, the world's largest oil exporter, and its main security guarantor, the United States, as tensions with Iran and elsewhere in the Middle East remain high. The residence search came after a report by the newspaper Yeni Safak cited what it described as an audio recording of Khashoggi's slaying. It described the 60-year-old Saudi journalist as having his fingers cut off and being decapitated after entering the consulate. 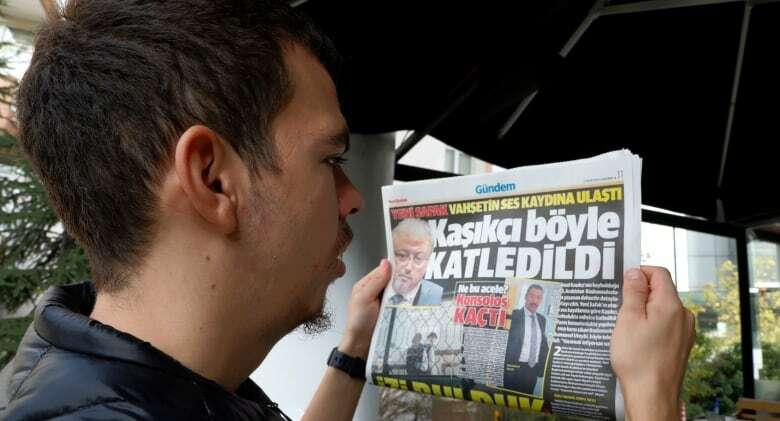 The report by the newspaper Yeni Safak cited what it described as an audio recording of Khashoggi's slaying. It described the recording as offering evidence that a Saudi team immediately accosted Khashoggi after he entered the consulate. Mohammad al-Otaibi, the Saudi consul general in Istanbul, could be heard on the tape, telling those allegedly torturing Khashoggi: "Do this outside; you're going to get me in trouble," the newspaper reported. One of the Saudis reportedly replied: "Shut up if you want to live when you return to [Saudi] Arabia." Security services in Turkey have used pro-government media to leak details of Khashoggi's case, adding to the pressure on the kingdom. U.S. President Donald Trump initially came out hard on the Saudis over the disappearance but has since given the kingdom the benefit of the doubt, even as U.S. lawmakers continue pointing the finger at Saudi Arabia. On Wednesday he denied trying to give the Saudis cover and said the U.S. wanted Turkey to turn over any audio or video recording it had of Khashoggi's alleged killing "if it exists." The Saudis have strongly denied the accusations, but U.S. media outlets have reported they may soon acknowledge Khashoggi was killed in a botched interrogation. That could, like Trump's softening comments, seek to give the kingdom a way out of the global firestorm of criticism over Khashoggi's fate. Pompeo, wrapping up a trip to Turkey and Saudi Arabia — where he met Salman and MBS — to discuss the diplomatic crisis generated by Khashoggi's disappearance, made a point to stress areas where the kingdom and the U.S. co-operate. 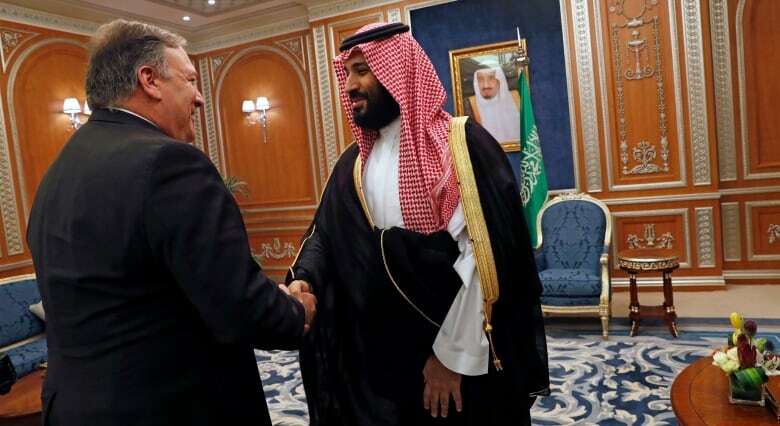 "We have lots of important relationships — financial relationships between U.S. and Saudi companies, governmental relationships… the efforts to reduce the risk to the United States of America from the world's largest state sponsor of terror, Iran," Pompeo said. "We just need to make sure that we are mindful of that when we approach decisions that the United States government will take when we learn all the facts associated with whatever may have taken place." How Saudi Arabia and its leadership — particularly MBS, who has worked to cultivate his image as a political reformer — emerge from the Khashoggi disappearance is a test of how the West will deal with Saudi Arabia in the future. At issue will be to what extent the West believes responsibility for Khashoggi lies with the powerful young ruler. There has been mounting criticism of some of the prince's moves, including Riyadh's involvement in the Yemen war, the arrest of women activists and a diplomatic row with Canada. Pompeo said Wednesday there were clear lines that America would not stand to see crossed.